Don’t miss the newest installment of this popular online course to learn from a brand new lineup of experienced leaders. Topics will include health and wellness maker programs, how to engage underserved users, crowdfunding your makerspace, launching a sustainable maker program from scratch, and more. 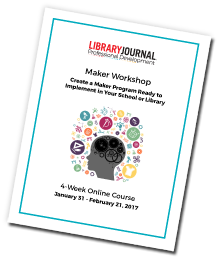 School Library Journal’s newest installment of Maker Workshop will feature all new, up-to-the-minute content to help you develop a rich maker program for your school or library. Join us to learn new ways of sparking engagement and hands-on learning. During this 4-week online course, you’ll hear directly from expert keynote speakers doing inspiring work that you can emulate, regardless of your library’s size or budget. Course sessions will explore culturally relevant making and how to assess your community’s needs, STEAM, mobile maker spaces, multi-media, 3-D printing and more! This time, we’ll feature special sessions within the overall Maker Workshop program devoted to teen programming ideas and education. Teen librarians will also have the opportunity to work within peer groups led by leading teen librarians. In addition to weekly guest speakers, participants will work in small groups with facilitators experienced in the maker movement to complete assignments and field research in your library that will fuel your maker program. In this recorded webcast, course advisor Carmen Scheidel, CEO of Edmaker.co, discusses the fourth installment of Maker Workshop and what to expect from the 4-week course. Ellen Druda also shares information about a program she launched at Half Hollow Hills Community Library (NY) that allows teens to create and assemble 3D printed prosthetics in bright and beautiful colors. Course advisor Carmen Scheidel, CEO of Edmaker.co, will lead you on a guided tour of the online classroom, explain how the assignments and homework groups work, and take any of your questions to help get you set up for our live keynote session. Acclaimed scientist Hope Jahren, whose 2016 memoir Lab Girl was chosen as a New York Times Notable Book, will share her experience working with plants, trees, flowers, and seeds as a fresh way to more deeply understand the natural world and approach learning about science. When Estria Miyashiro and Jeremy LaTrasse founded the Estria Foundation in 2010, they hoped to create lasting social change while empowering local communities through art. For their largest project, Mele Murals, artists, youth, and community members work together to create a series of large-scale outdoor murals focusing on Hawaiian lyrics (mele) that explore mo`olelo `aina (stories of place) and cultural and historical heritage. The process of developing these murals takes youth on a journey; not only immersing them in the process of making art, but also connecting them deeply and meaningfully to the history, culture, and stories of Hawai’i. littleBits—often described as electronic LEGO—makes it easy for students to create inventions. Product Lead, Erin Mulcahy, will share innovative ways to get started using littleBits in a classroom or school library. One of the founding beliefs of Urban Arts Partnership is that the arts are the most powerful tool we have as educators for closing the achievement gap, and they’ve been proving the truth of that statement for decades. In this exciting session, James Miles and Chenits Pettigrew join us to share ways to connect with and inspire students through music production and programming. They’ll explore creative ways to build a thriving music production program in your makerspace from the ground up, sharing examples from the work they’ve done with countless schools and student groups. They’ll also share their methods for integrating music production into educational curricula, making your maker project indispensable to your learning goals for your library. This session will leave you feeling inspired and ready to take on a music production project of your own. It’s no secret that video, music, and photography appeal to teens. In this dynamic session, learn about creative ways to take that interest and turn it into a multimedia maker program that keeps kids engaged and coming back for more. Laura Gardner, school librarian of the year finalist for 2016 will explore ways in which to jumpstart video production maker projects with your teen and preteen audience and specifically zoom in on how to use the app Touchcast to make video production come to life in your makerspace! Learn how using the principle of innovation in your library space can ignite creativity and passion within your students and patrons in this dynamic session from Don Wettrick, teacher and author of Pure Genius: Building a Culture of Innovation and Taking 20% Time to the Next Level. Don will discuss how interdisciplinary experiences rooted in interest, curiosity, and collaboration can create exciting, even life-changing learning experiences that your students and patrons won’t soon forget. He’ll offer practical insight into infusing innovation into your maker projects no matter what your budget or constraints may be, and show us that innovation is a powerful tool in creating a successful makerspace. Many dream of developing a makerspace, but the reality is that they don’t physically have the space to give that dream a home. This session explores how you can create the makerspace you want for you library, no matter your space constraints. You’ll learn about the wide – and wildly creative – world of mobile makerspaces, which are high on inspiration, but low on space commitment. Whether your maker plans involve pipe cleaners and paper, or computers and coding, creating a mobile makerspace can be just the thing to put that plan into motion. Creating meaningful dialogue is imperative to providing your community with services and programs that authentically connect with their needs. In this insightful session, Kristin Fontichiaro of the University of Michigan, discusses how to develop a rapport and cultivate a deep relationship with community members that can grow into diverse and creative projects that take serving the community to heart. Involvement in – and exposure to – hands-on making can advance girls’ success in STEAM fields and ignite new passions that can take young women through adolescence and into adulthood. Programs like DIY Girls, based in Los Angeles, seek to cultivate an engagement with technology and engineering in girls at an early age to foster growth in the number of girls and women in STEAM fields and unlock individual interests that may even grow into future careers. 3D printers are a popular feature of many makerspaces and are becoming more and more accessible, but where does one begin when considering whether to add this feature to their makerspace? Join Nick Taylor in a soup-to-nuts discussion of how to envision, establish, and troubleshoot a 3D printing program in your library makerspace. He’ll take you through the evolution of his 3D printing experience, including exploring his ideas for developing tiered makerspace tool system to organize your space. Is the maker movement a modern day re-envisioning of shop class? Home Ec? How can we tap into what made those classes so useful – their practical skill-building and hands-on creativity – and apply that to making in schools and libraries today? This session will explore the answer to those questions, and how the meeting of making in libraries and career and technical education in schools can be powerful allies in the interest of providing opportunities to make in all kinds of communities for all kinds of audiences. For this closing session, some Maker Workshop attendees will have the opportunity to present their most compelling makerspace ideas (in concept or execution) to their peers. Everyone will have an opportunity to submit their concepts via the online classroom discussion board and up to three people will be chosen to present live in the session hosted by School Library Journal Executive Editor, Kathy Ishizuka, who will also field questions about what she looks for in stories to cover in the magazine and online.